Let them know that ‘a logo’ generally consists of a ‘picture’ or ‘stylized text’ with a tag line. The rest of the information – address, phone, e-mail is not necessary. Websites are nice, but not generally necessary. Remember the ‘four foot rule’ that is simply stated ‘logos are viewed from four feet away’ and unless they are wearing a full jacket back, nobody is going to see any more than the logo and tag line. IMPORTANT: You must ask your customer if the logo has been digitized before. If so, we would need a scan or digital picture of the previous digitizing (with any available good artwork). We can’t reproduce what we can’t see. If the customer comes back to you AFTER we have digitized from art they gave you and did not give you the previous embroidery, a partial or full repunch will be charged. This is the biggest problem that we see with communication – and it’s so important. In Corel remember to ‘convert graphic to curves’ or the text will not work In Adobe illustrator ‘close paths’ or the text will not work. We can also accept .pdf and other formats, but we prefer to NOT have images that are copied from websites, as they are usually very low resolution. We prefer smaller, high resolution files – a high resolution .jpg is best. We need the following information: Desired size and location of embroidery – if you write ‘shirt crest’ or ‘finished hat’ we will quote at the smallest size Look carefully at the artwork (especially if a BUSINESS CARD or DECAL) to let us know what items are included, just the logo or logo plus web address, etc. We have other formats available – just ask. For your peace of mind, we do not store credit card information on our servers. We use one of the largest credit card processing companies that adhere to strict PCI compliance. Once you fill out the credit card form provided, we only have access to the last four digits of your credit card number and expiration dated. We do not really have a published price list. We take several features into consideration in order to give you the best possible price. We do price our digitizing as reasonable as possible to allow you to be more competitive in the marketplace. Designs are digitized according to artwork received and design consultation suggestions. We guarantee that our work will be technically correct. If your design does not sew correctly or we have made omission errors, we will correct the problem immediately. Any changes to the submitted artwork after the design is punched will be subject to an edit or re-punch fee. 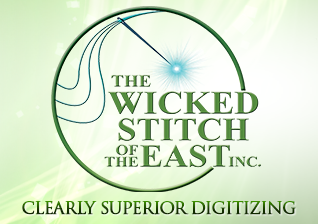 Does the Wicked Stitch have an embroidery department? No, Digitizing is our only business. We do not compete with our customers for embroidery work. Whether you live across town or in another country, you do not have to worry about us calling on your customers or using your designs for our own purposes. No. We will never resell a design that has been digitized for a customer — ever. If another customer requests a design that has been previously digitized, we digitize it as a new logo according to their artwork.